Welcome to you all: whether you are from overseas or Japan; whether you are a well-behaved or even if you are a little bit mischievous from time to time; whether you are a participant or a supporter-a welcome without limit to one and all. My name is Yasuo Tanaka, also known as the ‘anti-dam’ governor, determined to protect the beautiful natural surroundings and water sources of this prefecture of Shinshu-Nagano, located on the very spine of the Japanese islands. In Shinshu-Nagano, we are aiming to achieve the dream of what I call an inclusive ‘Commons’ society, open to one and all at the community level, regardless of age, ability, gender, career, status or nationality. We do not limit opportunity because of perceived barriers of ability. All that we desire is an open society within which everybody has an equal chance to live out their hopes and dreams. It is a great pleasure and honor to have the Special Olympics here in Shinshu-Nagano, where we are at the cutting edge of inclusion programs in Japan. Here people with intellectual disabilities do not have to be shut away from society in closed institutions or colonies, but instead are able to live alongside their loved ones. This “Commons=Region” concept underpins the way we are building our community here. We are holding an exhibition “Art S.O.” at the Prefectural Shinano Art Gallery beside Zenkoji Temple, running simultaneously with the Special Olympics. There you can see beautiful works of art created by people living with intellectual or mental difficulties. Coincidentally, in Switzerland there is a museum called “Musee de L’Art Brut” in Lausanne, on the shores of Lake Léman, founded by my favorite and treasured artist Jean Dubuffet. I cannot help but feel deeply impressed at moments when I see so-called ‘Outsider Art’ created by such artists. Such moments remind me that although we might live without great difficulties in this super-efficient society, in reality we sometimes exist just like cogs in the machines that Charles Chaplin portrayed in his film “Modern Times” 69 years ago. The true irony is that such artists, by the way they create such “L’Art Brut” or art in the raw, can teach us all so much about the true essence of humanity. 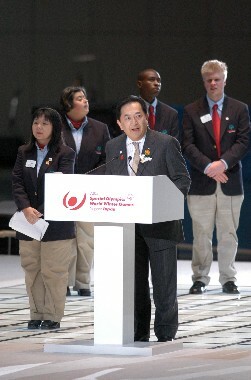 Although at one level, the Special Olympics is an event at which we try to showcase the abilities of the participants, the truth is that the athletes are the true teachers, and we are all able to become re-acquainted with a level of certainty and joy within ourselves that we had perhaps almost forgotten. I hope this is a genuine blue-sky opportunity for many people around the world to re-discover their own humanity through this heart-moving festival. Thank you. Copyright Nagano Prefecture.All Rights Reserved.